"Be consistent with what you feed your horse everyday." Normally, horses will eat the equivalent of about 2.0 percent of their body weight. Feeding your horse should be done at minimum twice a day - more frequent is better, but not always practical. It is best to feed little and often since a horse's stomach is small and is made primarily for grazing (small amounts of food constantly entering and leaving the stomach). You should feed your horse at the same times each day. Once the horse adapts to his feeding times don't change them. If you are required to change the times, do it gradually. Be consistent with what you feed your horse everyday. Don't arbitrarily change the type or brand of food or amount you give to your horse. If you must make a change, do it gradually. Continue giving your horse the old and gradually mix the new everyday, or gradually add or decrease the amount of food everyday until you have completely converted. Feed your horse in a place that is quiet and calm. Always ensure the horse has returned to normal body temperature and breathing after a workout before feeding. Do not exercise your horse for at least an hour after he has finished eating. Normally, horses will eat the equivalent of about 2.0 percent of their body weight as dry matter per day (this includes forage and grain). A horse is considered in good body condition when its ribs cannot be seen but can be felt by applying slight pressure over the ribs. If you are unsure about your horse's diet, contact an independent equine nutrition expert. Though food manufacturers provide helplines, they may be a bit biased, so use your judgment. Contacting an equine college or veterinary school is a good source to help you evaluate the nutrition you are providing your horse. Providing your horse with some succulent food each day, for example apples, carrots, parsnips, is not only a treat for your horse, but also provides some additional nutrients. You could also feed a small amount of handpicked grass if done immediately after picking. Grass will ferment quickly after being cut. For this reason, do not feed lawn mowings or allow your horse to graze on freshly cut grass. Hay: Your horse will need hay supplement during times of snow cover or when pasture forage is not available or limited. Feeding your horse hay will also extend the grazing season on small acreage properties. A rectangular bale of hay weighs between 45 and 85 pounds. The amount of hay to buy and feed should be based on the weight of the bales and the nutrient value of the hay. You can feed your horse less hay if it is higher quality, such as when feeding alfalfa hay. An average 1,000-pound saddle horse will eat 20 lbs. of forage each day (roughly 3-to-4 flakes of medium quality hay). Alfalfa hay is higher in protein than grass hay. 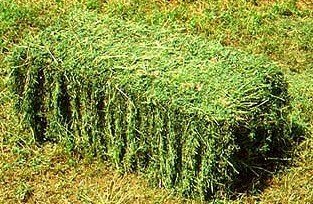 You should feed less Alfalfa hay than grass hay; however, feeding more grass hay will keep the horse busy eating longer and prevent boredom. Second and third cuttings of hay are higher in protein than the first cutting. Your horse only needs 10-12% protein in its feed. Second and third cutting alfalfa hay averages 18-24% protein which is more than the horse needs and this hay is more expensive. Hay must be dust and mold free to be healthy for your horse. Weeds have limited nutritional value and the seeds can be passed through the manure and infest your pasture. Buy hay that is free of weeds as some can be poisonous to horses. Tip: Does a lot of hay go to waste by your horse spreading it all over the place? Try putting the hay in an old tractor tire...this helps to reduce wasted hay by keeping in one place. Feeding your horse has never been easier than it is today ... but it has also never been more difficult. Thanks to commercial feed manufacturers and innovations in technology and transportation, feed is now available year-round. The 6 things you must know before you feed your horse. 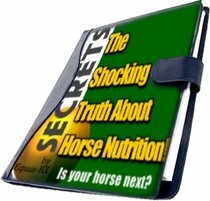 Is your Horses Protein working? Is it possible to kill my horse with water? Is it true vitamins give my horse energy? It is generally recommended horses be fed hay rather than processed (pelleted, ground, wafered, cubed) forages. Feeding your horse hay tends to reduce the rate of consumption, and helps to maintain digestive health. Providing hay as opposed to processed forage increases the amount of time spent eating, increases saliva flow, and reduces the level of boredom and associated behavioral problems. Poor quality hay should never be used in your horse's diet. Excessive dust, mold, weeds, insect infestations, or foreign material are factors reducing the overall digesting suitability, and can lead to a number of problems ranging from low feed consumption to irreversible respiratory disease and/or toxicity. Higher quality hay is higher in energy and protein will require less concentrate supplement to meet the nutrient needs of your horse. Grain: A grain mix of oats and corn should only be added to the diet when you increase your horse's training, work, or activity. Younger and older horses may also need grain. Horses have small stomachs and short intestines; therefore, they cannot handle large amounts of grain fed to them at one time. When providing grain to horses, it should be done in small amounts (3+ times daily). Be careful not to overuse the grain supplement. It is not healthy for a horse to consume large amounts of concentrated grain and if overused, can cause colic, ulcers, and high insulin levels. A minimum of 1.0 percent body weight of roughage (pasture, hay, or other forage) should be offered daily to ensure adequate intake and digestive health. Salt should always be available to your horse - either add approximately one to two ounces to your horse's feed or make available a free-choice salt block. Put a few large rounded rocks in the bucket (large enough that they can't be eaten or swallowed). The horse will have to nose around and push the rocks aside to get to the grain. This will help to slow down eating so it is not so hurried. Water: Your horse needs plenty of clean, fresh water at all times. Approximately 50% of an adult horse's body is composed of water. 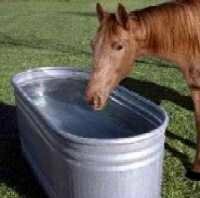 A horse will drink 10 to 12 gallons of water each day. In winter months, stock tank heaters will help to stop ice buildup so that your horse will have access to water. Make sure a hot horse, such as after exercising or doing heavy work, does not have free access to water right away. Only allow for just a few sips, and then walk him to cool him down. Once the horse's body has cooled down and breathing has returned to normal, let him have water freely. Some horses may refuse to drink later if not offered a small amount of water fairly soon after his workout. Regularly scrub out buckets, containers, troughs and automatic drinkers. Clean and disinfect community water sources if a sick horse is detected in a group. Sick horses should have access to a separate water source until they are considered healthy again. West Nile Virus is a concern. You can put feeder goldfish in pasture water tanks and they will feed off the mosquito larvae that mosquitoes deposit in the water. The goldfish will live throughout the winter as long as the water does not completely freeze. In areas susceptible to very hard freezes, a tennis ball or soccer ball floating in the water tank will keep it from completely freezing over.